Update October 12, 2016: A huge number of additional changes were made to Inferno overnight, fixing many bugs and community complaints. Valve continue to improve their latest map remake with a raft of bug fixes applied last night. Here’s the list. For the latest CS:GO updates to the main game, check our dedicated article. Updated radar with stairs and balcony in top of mid/alt mid. They’ll likely be several more of these patches before Valve, inevitably, re-releases one of the community’s favourite maps to almost zero fanfare. Original story October 11, 2016:Counter-Strike: Global Offensive’s beta branch has updated with a raft of potential changes and bug fixes as well as the return of an old friend: de_inferno. 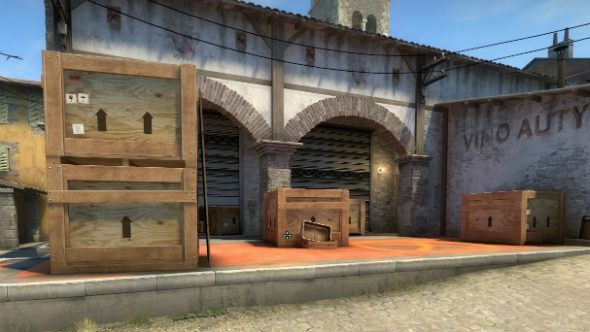 Inferno was removed from the game’s Active Duty competitive playlist of maps in April, subbing in the revamped de_nuke while the Italian village-based map woud undergo the same refresh process. It’s looking like that process is coming to an end and Inferno is being prepped for return to the front lines with brighter colours and wider choke points. You can see what the whole map looks like in a flythrough in the video above, but there are a number of other changes to the game that aren’t quite as flashy. Among them are some more attempts to fix the eternal problem of “crouch spam” but the changes appear to be getting further and further into the realms of ridiculousness so they must be getting close. Also there’s a little added notification to help out players who might not know Windows 10’s Game DVR is eating their frames. Thanks Volvo. Tholvo. Added a 0.4 second cooldown to the crouch button to reduce the visual noise from spamming crouch in the air. This is tunable via the convar sv_timebetweenducks. Fixed a case where a player’s crouch state did not match the state of the +duck key. The most noticeable case was when taking over a bot that was crouching. Adjusted bomb plant animation when planting the bomb while already crouched. Fixed a bug where molotovs/incendiary grenades did not generate flames when they exploded on the corner of a ledge. Sniper scopes are much more responsive to your actual accuracy; the blur is driven by your current inaccuracy. NOTE: There are no gameplay changes to scoped accuracy. The display now more-correctly represents your current inaccuracy. New console variable cl_crosshair_sniper_show_normal_inaccuracy (default 0) includes standing inaccuracy and spread in your sniper crosshair blur. weapon_air_spread_scale (default 1): Games that focus on air combat can set this to a lower value to improve weapon accuracy for players in the air. sv_enablebunnyhopping (default 0): Disables the air-velocity clamping to 110% of maximum running speed. sv_autobunnyhopping (default 0): Holding +jump causes players to automatically re-jump at the exact landing tick.